ORA is now offering an Aquacultured Blue Cespitularia. This unique veriety of Blue Cespitularia has a turquoise body that literally sparkles, and peachy-orange polyps. This beautiful variety is different from the African variety marked by a darker blue and purple coloration. The ORA Blue Cespitularia is much brighter and is very easy to care for. Sometimes referred to as “Blue Xenia”, is a beautiful soft coral, that will add a unique look to any tank. It’s hard to beat the color and movement of this coral. Blue Cespitularia will adapt quite well to different lighting conditions, but the most intense coloration was noticed when this coral was under lower light levels. Start this coral at the bottom of your tank, and gradually move it up to it’s final destination. Best results with the Blue Cespitularia from ORA were experienced under moderate to high current. 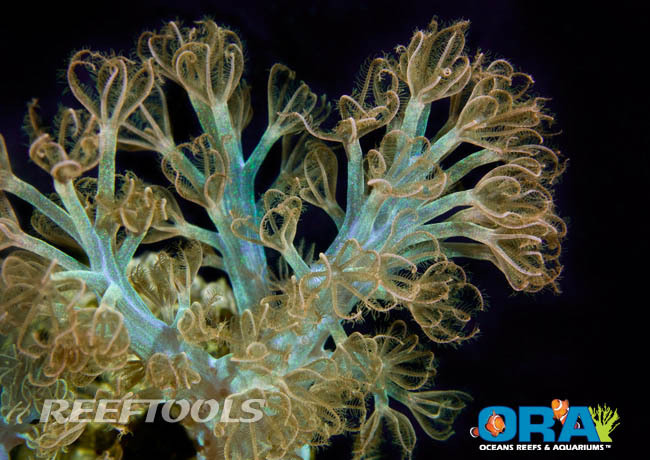 This coral will spread by sending out a “foot-like” projection which attaches to nearby rocks or solid surfaces.